This morning I made my way again to Sophia Gardens for the final day of the County Championship Division 2 match between Glamorgan and Northamptonshire. I wasn’t exactly brimming with enthusiasm, so didn’t get to the ground for the start of today’s play, but I thought I’d observe the last rites. When I got to the ground, night watchman Tim van der Gugten had already been dismissed, but there was some reasonably bright batting by Chris Cooke and Kieran Carlson. Coincidentally, I took the above picture just as Brett Hutton was about to bowl the delivery that accounted for Carlson, who nicked it into the slips for 32. Hutton also accounted for Cooke, who got one that seemed to keep low and knocked his leg stump out of the ground. Glamorgan reached 199 for 8 when Smith was lbw to Nathan Buck for 4. In came the youngster Prem Sisodiya who survived the rest of Buck’s over. Salter got off the legspinner Prasanna at the other end to bring up the 200 and bring Sisodiya on strike. A few balls later he pushed too hard at a good length ball and it went straight into the midriff of silly mid-off, who held on. That was a bit unfortunate for Sisodiya, who thereby bagged a pair in this match. Prem Sisodiya’s dismissal made it 200 for 9 and, with Mike Hogan being unable to bat owing to injury, that was the innings closed and the end of the match. As I predicted, it was all over before lunch. Northamptonshire won by 233 runs. Congratulations to them on a well-deserved victory: they were clearly the stronger team. I always thought Glamorgan would struggle with the bat on the last day on this pitch. The variable bounce that has been there throughout the match seemed to get worse. The wrist spinner Prasanna extracted appreciable bounce and turn throughout the morning, to the extent of making life very difficult for his own wicket-keeper. One delivery from Prasanna leapt up so alarmingly that it went over the keeper’s head for four byes. I must admit, though, that I enjoyed watching the legspinner in action with fielders around the bat. As someone who tried to bowl wrist-spin when I was younger, I always enjoy seeing it done properly. I think it is important to look on the bright side of disappointments like this. After all, in an uncertain and at times frightening world one can take comfort in the reassuring familiarity of a defeat for Glamorgan. Moreover, having already finished bottom of the table in the Royal London One-Day Cup, and looking likely to do the same in Division 2 of the County Championship, there will be a lot riding on this year’s Twenty20 competition: can Glamorgan pull off the treble? For the record, I thought I’d post a short update on today’s play at Sophia Gardens. I only attended the morning session today. I forgot to take my phone so there’s no picture. It was a good morning’s play actually, with Glamorgan’s bowlers doing better. The huge opening partnership of 208 was eventually broken when Procter fell, soon followed by Duckett. How often it happens that both batsmen involved in a big stand get out in quick succession. Another three wickets fell for the addition of 90 runs. However at 259 for 5, with the Northants lead at 289, at lunch I reckoned the game was already beyond Glamorgan, and instead of returning to the ground after lunch I took a stroll around sunny Bute Park and went into the Data Innovation Research Institute office to attend to a few things. Northamptonshire progressed to a total of 406 and declared when their 9th wicket fell. Tea was taken at that point. In the last session, Glamorgan slumped to 121 for 4, the first innings hero Khawaja among the fallen. Glamorgan need to score 313 tomorrow to win. More relevantly, Northants need to take 6 wickets. I wouldn’t bet against the game finishing before lunch, actually. 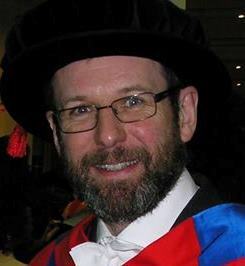 Here I am, back in Cardiff and officially still employed at Cardiff University, but now taking up the annual leave I am owed before I depart. 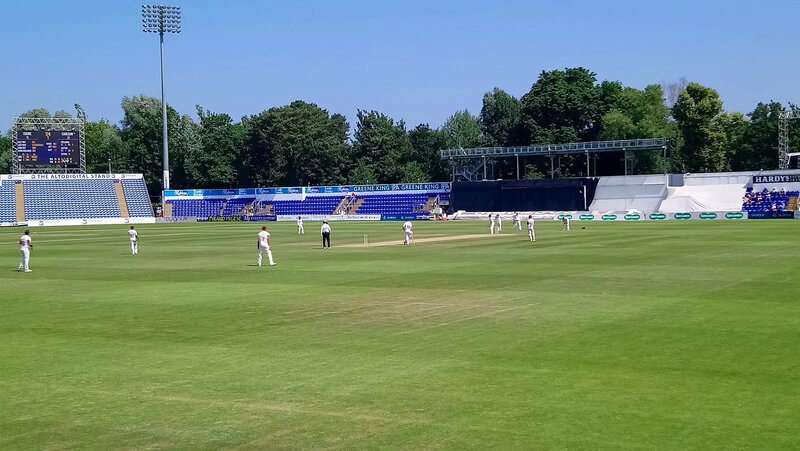 The plan for this week’s leave, or at least four days of it, is to watch Glamorgan play Northamptonshire in Division Two of the County Championship at Sophia Gardens. It proved to be an absorbing day’s cricket. Northants won the toss and, unsurprisingly, decided to bat first. Glamorgan had an early breakthrough from Hogan and Smith but Northamptonshire reached lunch at 87 for 2, with Wakely and Vasconcelos looking settled. The latter fell soon after lunch, but Wakely and Levi then took Northants to tea without further loss. The pair went on to share a stand of 118 until Smith (who was expensive but troubled all the batsmen) got Wakely caught in the slips by Khawaja for a fine 82. Soon Northants were five down for 231 after Rossington departed for 7, but Crook and the combative but slightly portly figure of Levi took the score on to 275 for 5. At that point a decent score for Northants still looked likely. Then Glamorgan took the new ball and Tim van der Gugten steamed in. Levi had an awful waft at the first ball and was caught: 275 for 6. At that point all the wickets to fall had been caught behind the wicket, either by the wicket-keeper or in the slip cordon. What had troubled the batsmen had been bounce rather than lateral movement, which is a fairly typical Sophia Gardens wicket. Anyway, two balls after Levi departed new batsman Prasanna tried to play some kind of shot (I know not what shot) and succeeded only in spooning up a dolly catch to mid on: 275 for 7. Next over Hogan brought one back into Crook who was adjudged lbw (though if truth be told it looked a little high to me): 279 for 8. Then it was van der Gugten’s turn again, getting one to lift at Hutton (no, not Len). The ball flashed into the slips and looked to have gone past Khawaja but somehow he plucked it out of the air for one of the best catches I have ever seen: 281 for 9. Last man for Northants, Sanderson, walked to the wicket in the manner of a condemned man approaching the scaffold and when he got there he was clean bowled first ball by van der Gugten. Northants all out for 281, their last five wickets falling in the space of three overs. Quite a turnaround in the final session: Northants were 199 for 3 at tea. Northamptonshire’s rapid demise left Glamorgan seven overs to bat before the close; openers Selman and Murphy negotiated them safely to end the day on 21 without loss. It was a very absorbing day’s cricket on a very warm day indeed. I’m glad I had plenty of suncream on, as there were many in the crowd looking distinctly frazzled. I don’t normally criticise umpires because they do a very hard job, but I feel I should mention one major lapse. Fortunately I don’t which it was so I can’t mention him by name. During the Northants innings, a batsman (Kevin, I think) played a shot to the mid-off area and set off for a quick single. The fielder threw and hit the stumps at the non-striker’s end with the batsman apparently short of his ground. Unfortunately the umpire, who was moving to get out of the way, had turned his back to the action and couldn’t give the decision. There being no third umpire in County Cricket, that meant it was ‘not out’. I thought that was poor: umpires should keep their eyes on the play all the time. I would have thought a first class umpire would have done so. Anyway, I’m looking forward to the second day to see if Glamorgan can capitalise on Northamptonshire’s collapse. I’ve followed Glamorgan long enough to know not to take anything for granted!